While they might be small, Beagles are very active companions for adults as well as kids. Beagles tend to be fun-loving and merry but they can also be stubborn which makes for having to make some patient and creative training techniques. Their noses guide them everywhere in life, so they are excel at hunting and tracking small animals, like rabbits. Beagles come from the Hound Dog breed group and they range from one foot to one foot, three inches tall at the shoulder. They are relatively small, weighing from eighteen to thirty pounds. A healthy Beagle can live from ten to fifteen years so make sure to keep your precious Beagle happy and healthy. Unlike many other dog breeds, the Beagle’s origin is uncertain. There are many theories of where the Beagle came from, but no certain one. 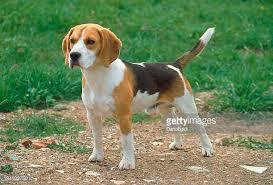 Some believe that the Beagle may have come from the French word “begueule” meaning open throat or “beag” from the Old English word meaning small. 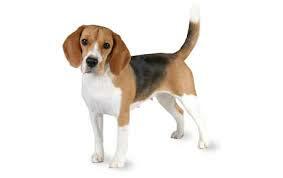 The Beagle possibly dates back to 400 BC from Greek documents that describe Beagle-like dogs hunting rabbits. Beagles became popular in England very early. 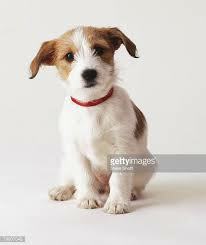 Elizabeth the First who lived from 1533 to 1603 was said to keep packs of Pocket Beagles that were only nine inches tall. 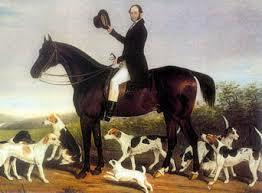 These dogs were also used for hunting but soon they stopped being used as hunters and were used more for their looks. Once Americans started breeding them, they wanted the Beagle for their good looks. 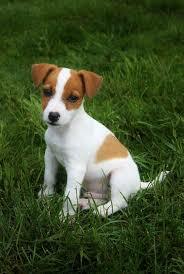 Americans also bred the Beagle to be smaller so that they would be better at hunting rabbits. The American Kennel Club and the Beagle speciality club were both founded in 1884 and in 1916, the Institute Foundation that maintains the National Beagle Club was made. Beagles can be very gentle, funny, and sweet which makes for a great family dog but they can also be very difficult because of their bad behavior. 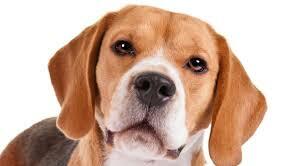 Beagles are very intelligent which makes it very hard to train and manage the dog. Like other dogs, it is very important to socialize your Beagle early, to different people, sights, sounds, and experiences, as young as possible. Beagles are a good family dog because they are able to bond with everyone in a family, even children as long as they are properly socialized. While Beagles might be “mouthy” and tend to grab at things, they only do this for fun and can be trained not to do it. 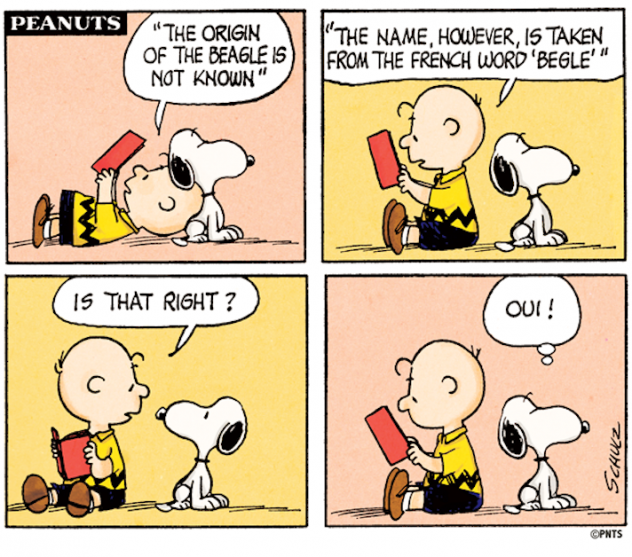 One of the most famous cartoon dogs just so happens to be a Beagle: Snoopy from Charlie Brown. While many people think that Snoopy does not look like a Beagle, Snoopy is a true Beagle through and through. Beagles are full of energy, are very musical, have a big appetite, tend to be lazy, but are also very loving and intelligent. All of these adjectives go perfectly with the famous dog. One of the most important qualities of Beagles is that they are loyal. 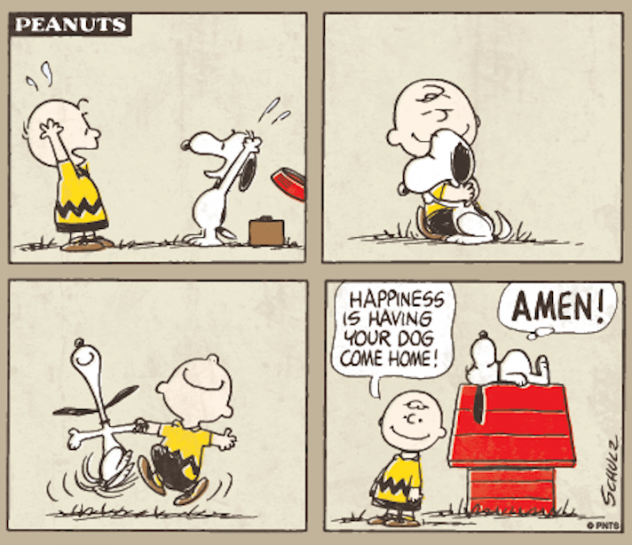 This quality is seen very clearly with how Snoopy acts toward Charlie Brown: a match made in heaven. As always, remember that dogs are always up for adoption. Maybe you, a friend, or your grandparents, are looking for a nice companion, so go ahead and adopt! If you are looking for a beagle specifically, visit this site for more information. 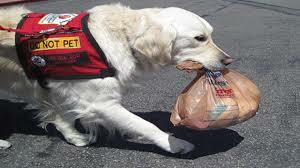 Service dogs are dogs that are trained to perform a specific task for people who have disabilities. A person can get a service dog for various tasks depending on the disability. Service dogs can help in navigating people who are hearing and visually impaired, they can assist someone who is having a seizure, they can calm people with Post-Traumatic Stress Disorder, and some dogs can even call 911 in an emergency. 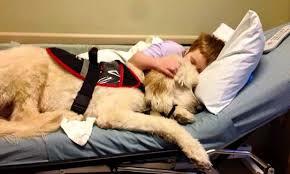 Many people depend on service dogs to help them in their everyday lives. Service dogs are protected under the Americans with Disabilities Act (ADA). This law states that an individual with a disability is entitled to a service dog to help them live their lives normally. The ADA allows people to bring their service dogs in most public places, like restaurants, hotels, housing complexes, and air travel. One of the most important parts of this law is that the dog is trained to be a working animal, not a pet. Service dogs go through a long training process and are specifically trained to help those who need it. The ADA has a specific definition of a disability that states that a disability is a physical or mental impairment that limits one or more major life activities of such individual. 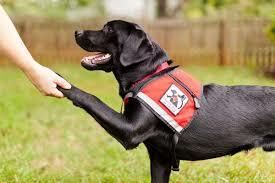 Service dogs are usually wearing some type of vest and a tag to identify that they are a service dog and is helping another person. Many businesses and airlines also require an identification card or vest that specifically indicates that the dog is a service dog and not just a pet. There are three types of service dogs: hearing, guide, and service dogs. 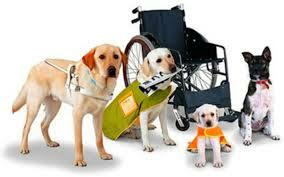 Guide dogs help those who are blind or visually impaired. Hearing dogs help those who are deaf or hard-of-hearing. Service dogs assist those with a disability, like those who use wheelchairs, have balance issues, or other medical issues. Making a dog a service dog is a very long and arduous process. Dogs must be able to perform their tasks on command and perform the skills that are required for the Assistance Dogs International Public Access Test which is a series of objectives designed to evaluate the dog’s behavior in distracting environments. Organizations who train these dogs have very high standards and many dogs do not actually pass the final requirements to be placed with an owner. 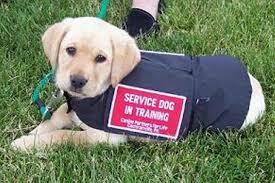 The dropout rate for organization-trained service dogs can be as high as 50 to 70 percent. This is important because the ADA regulations state that service dogs must be under control and house-trained at all times in a public setting. 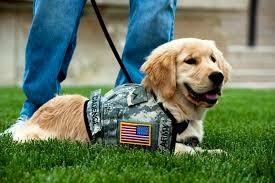 Dogs training to be service dogs usually take two years of training from organizations. It is very serious and very difficult for a dog to get through. A service dog in public is always working. a service dog is doing vital work for their owner so it is important to not distract the dog. This includes petting, using baby talk, crowding the dog, or touching the dog at all unless the owner says that it is ok.
Not all service dogs are the same. they do not all look alike or are they the same breed. A service dog is considered medical equipment. a person would never walk up to someone that they didn’t know and start pushing their wheelchair, their heart monitor, or their cane, so it is important to not touch, talk to, or pet a service dog that you do not know. A service dog is protected under the law. the ADA states that a service dog can go anywhere in public places. Never ask a person why they need a service dog. Although you might be curious, it can offend people if you ask and it can be considered rude. A person does not have to explain why they need a service dog to anyone that is not an official who needs the information to make sure that the dog is a legitimate service dog. Service dogs are truly remarkable animals so be sure that if you see a service dog in public to not pet the dog or distract the dog from its work. Always treat service dogs as well as their owners with the respect and privacy that they deserve. If you would like to learn how to train your dog to be a training dog, you totally can but it will take a very long time. 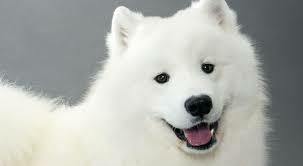 The strong-willed and smiling Samoyed is a very hard-working dog; it can do many jobs. They can pack hike, track, and even warm their owners by sleeping on top of them at night. 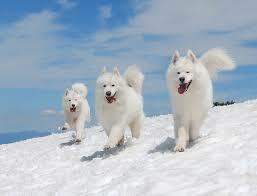 While they are very serious about their jobs, the Samoyed they are very friendly, gentle, and devoted family dogs. 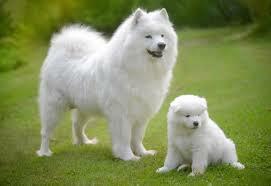 The Samoyed Breed is a working dog breed so they are bred to be ready to work. They range from 1 foot, 7 inches to 2 feet at tall at the shoulder. They also range from 50 to 60 pounds making them a pretty solid dog. 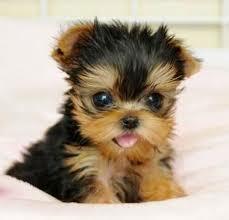 They have a nice long life span of 12 to 14 years so this dog will definitely be a big part of the family. The Samoyed was originally bred to hunt, herd reindeer, and haul sledges for the Siberian Samoyede people. Instead of treating the dogs just as working dogs, the Samoyede people treated the dogs very kindly and even brought them in to join the family at the end of the day. Because of this closeness between the dog and the people, it created a sense of loyalty and trust in the breed that still remains to this day. These dogs went through Siberia at the end of the 19th and early 20th century to pull sledges on polar expeditions. These missions were very hard for the dogs but they endured it, making them the one of the strongest and fittest dog breeds. The original Samoyed Club of America was organized in 1923 which was the same year the American breed standard was adopted. The Samoyed is intelligent, gentle, and loyal as well as friendly and loving to its family, even children, which makes them great watchdogs. Samoyeds thrive on being part of a household and love the hustle and bustle of the family lifestyle. With this, the Samoyed does not like being alone and is not the type of dog that can be left alone in a kennel or a backyard. Samoyeds, while being good with people, are still hunters at heart so they are very likely to chase after animals that seem like prey so it is important to keep them fenced in a yard. As usual, it is very beneficial to socialize the dog at a very early age to make them the best dog possible. Samoyeds are very unique because they look as if they are smiling because of the upturned corners of their mouth. Aside from being very cute, these feature has a very practical use; the mouth’s upturned corners keep the Samoyeds from drooling, which then prevents icicles from forming on their face.The smile of the Samoyed perfectly fits because they are known for being very happy and good-natured with only love to give to the people around them. 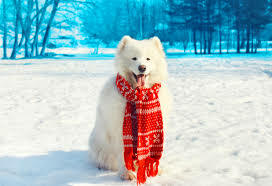 Samoyeds were specifically bred to be able to work in the world’s coldest places. For example, the Siberian town, Oymyakon, regularly goes down to temperatures of -60 degrees. Their legendary white fur, aside from being beautiful, is also thick enough to protect themselves against brutal conditions. If you want a dog to keep you warm at night and protect you from unwanted prey, adopt a Sammie right now! 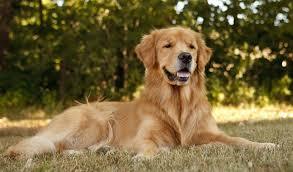 The Golden Retriever is one of the friendliest dog breeds which makes them a wonderful family dog. This breed is also very smart and strong, making them a very capable working dog. They are very well-rounded because they are hunting dogs, drug-sniffing dogs, therapy and guide dogs. 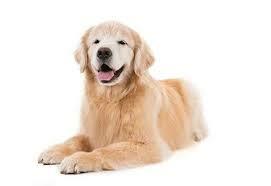 Golden Retrievers are also very athletic and do well in agility activities as well as obedience. Because of their athleticism, Golden Retrievers are in the Sporting Dogs breed group. Their height ranges from 1 foot 9 inches to 2 feet at the shoulder. They also weigh from 55 to 75 pounds so they are a pretty solid dog. 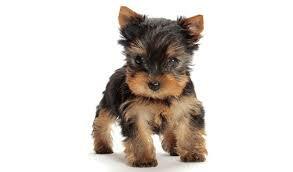 Their lifespan is 10 to 12 years so make sure to take care of your pup for those years. It was a legend, for many years, that the Golden Retrievers descended from Russian Sheepdogs from a circus. But in actuality, the breed was developed in Scotland at the estate of Sir Dudley Majoribanks who was later known as Lord Tweedmouth. Tweedmouth wanted to make the perfect dog by breeding all types of different dogs together. He was interested in making a dog that would have a great nose for hunting as well as be very attentive to his or her human companion. Aside from being a good hunting companion,Tweedmouth also wanted the dog to be very loyal and even-tempered in the home so they could be around children. The Kennel Club in England recognized the Golden Retriever as an actual breed in 1911 and they were classified as “Retriever-Yellow or Golden.” In 1920, the breed name was officially changed to the Golden Retriever. 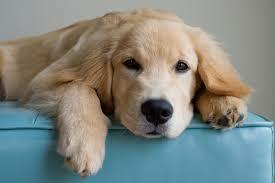 Today, the Golden Retriever is the second most popular breed in the United States. 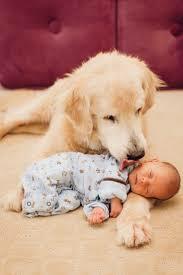 The Golden Retriever was bred to work with people and is always eager to please their owner. They are very hard-wired and disciplined but must be well-raised and well-trained to make the most of their hard-working genes. Like all the other dogs that were talked about in this blog, the Golden Retriever needs early socialization of many different people, sounds, and experiences when they are young to ensure that they grow up to be well-rounded and good around people. Golden Retrievers are built for action and love being outdoors. They like to hike or jog and playing fetch outside, because true to their name, they love to retrieve. It is important to give a Golden Retriever a good 20 to 30 minutes of exercise twice a day so the dog will be mellow for the rest of the day. If the dog does not get a proper amount of exercise, they will have too much energy and it can lead to behavioral problems. 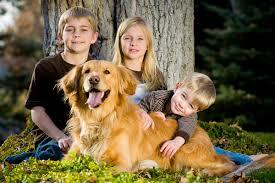 It is very common for Golden Retrievers to be part of a family with children. While they do love to be around children, they are very large and strong and can easily knock over a small child by accident. With this, a Golden Retriever has to be socialized early to be around children and learn how to interact with them. It is also important to teach children how to approach and touch the Golden Retriever. Interactions between dogs and children should be supervised at all times to make sure there is no biting or ear or tail pulling from either party. Golden Retrievers, aside from liking children, also like other dogs. They can also be trusted with cats, rabbits, and other small animals with proper introductions and training. If you want a friendly companion, adopt a Golden Retriever now! 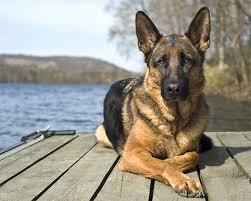 The famous German Shepherd is one of the most popular dog breeds because of how intelligent and capable they are. They are devoted, courageous, and versatile. They are so easily trained which is why they make great guide and assistance dogs, police and military service dogs, drug detection dogs, and search and rescue dogs. Aside from being great at the many jobs that they do, they are also wonderful companions. 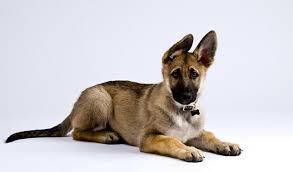 German Shepherds are herding dogs who are medium sized, ranging from 75 to 95 pounds and about 1 to 2 feet tall. They have wonderful trainability and are very good with people but not necessarily other dogs. They are a very active breed and need daily exercise but it is also very important to socialize a German Shepherd to other dogs as well as people as early as possible. 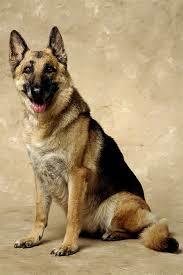 The German Shepherd dates back to 1898, making it a relatively new breed. This breed is very unique because it stems from one man: Captain Max von Stephanitz. He was a captain in the German cavalry who wanted to create a German herding dog to attend to the farms. After Stephanitz retired from the military, he devoted his life to creating the perfect herding dog. He studied the breeding techniques of the British and he also traveled around Germany to observe the perfect German-type herding dog. One day, he finally found the perfect dog: a wolfish-looking dog with a powerful physique and intelligence unmatched by any other dog he ever saw before. With the world industrializing, Stephanitz realized that there was not a need for a herding dog but rather a military dog. Stephanitz then asked the government to use the dog in World War I and the German Shepherd served as a Red Cross dog, messenger, rescuer, and guard. The breed was so popular that it traveled to America and continued to be breeded there. 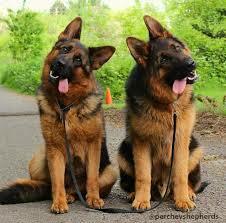 German Shepherds are extremely loyal once they get to know someone. At first, they are very shy and are not good at making friends, but once they do, they are extremely devoted to them. When they are comfortable with people they know, they are very easy-going and nice but if they are feeling threatened, they become very strong and protective which makes them a powerful watchdog. German Shepherds love having a job to do and they are very good at any task that is presented to them because of their superior intelligence. While they are usually very easy-going, German Shepherds are not good at being alone. They need to let their energy out in some way, whether that be with another companion or with a walk outside. 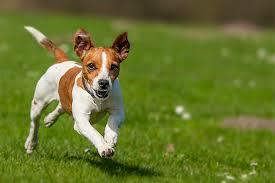 If they do not let out their energy, they can get easily agitated and resort to barking or chewing. One of the most important things to do for a German Shepherd, besides exercising, is to socialize the breed at a very young age so that the dog grows up to be well-rounded and agreeable. 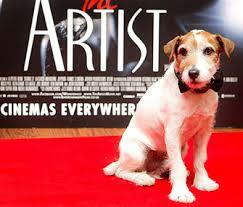 Because the breed is so popular, it is no wonder that there are many celebrities that own this powerful breed. For example, Tom Hanks, Jake Gyllenhaal, Ben Affleck, Reese Witherspoon, and Jennifer Aniston are just a few celebrities who all have German Shepherds. These celebrities take good care of these dogs because they are always seen walking them around California. 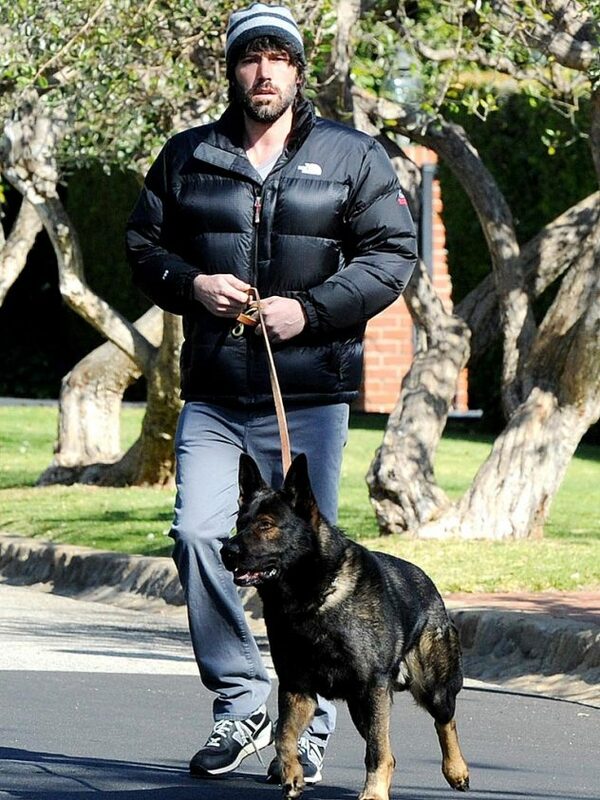 If you want to be cool like Jake Gyllenhaal in a beanie, then adopt a German Shepherd! Maybe you have younger siblings at home who have been begging your parents for a dog. If so, this is a terrific breed to get because you will get a protector as well as a friend. 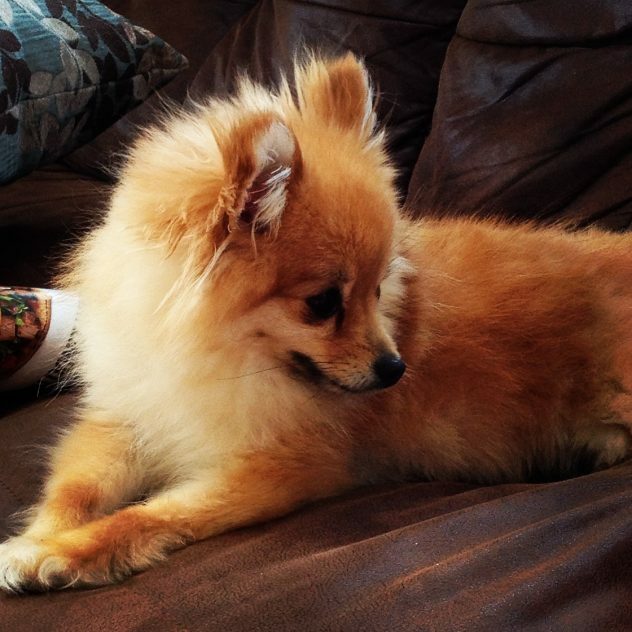 So to start off my blog, I feel the need to start off the “Breed of the Week” with my inspiration: Penny the Pomeranian. I got Penny the summer before eighth grade and it was one of the best days. My sister and I got her as a joint birthday gift and I can say that, without a doubt, it was the greatest birthday present I have ever received. When we first got Penny, she was about two pounds. Pomeranians are a small breed and Penny was from a teacup breed (extra small) so we knew that she was going to be pretty tiny, probably around eight to ten pounds. Well, after five years of having Penny, her weight has never gone over three pounds. So yes, she is abnormally small, basically more of a hamster rather than a dog. While Penny is pretty miniscule, she is as ferocious as pitbull. She most certainly has a Napoleon Complex. Anytime she is under the impression that someone is yelling at me or “attacking” me (aka my mom peacefully and sweetly waking me up in the morning), she flips out and starts to attack the culprit, no matter how big they may be. But believe me when I say that her high-pitched bark is much worse than her non-existent bite. Now that you all have a little bit of background about my obsession with my dog and why I chose this as my passion, let’s get started. Pomeranians are companion dogs or lap dogs that are usually seven inches to one foot in length with a weight of three to seven pounds. They also have a pretty long lifespan: twelve to sixteen years. While I wish that they could be immortal, sixteen years will have to do. 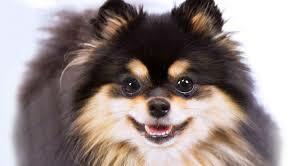 Pomeranians, also known as “Poms,” get their name from Pomerania, which is a province in Germany. Pomerania lies along the Baltic coast and is divided between Germany and Poland. Pomeranians became especially popular and much more well known after Queen Victoria, the Queen of England. Queen Victoria was said to have Poms throughout her life and liked them to smaller in size so she would breed them smaller. She also allowed pomeranians in London Dog Shows for the first time. This allowed Pomeranians to be shown in the public eye and they became a very popular breed. 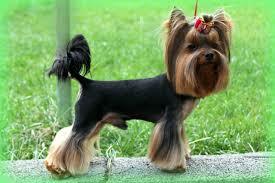 So aside from Victoria making the breed more popular, she made it the norm for Poms to be smaller in size. 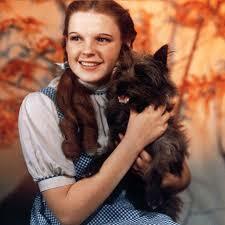 There are many famous people who were said to have Pomeranians. 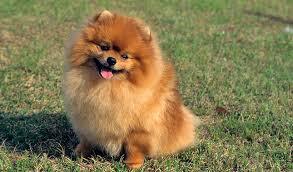 For example, Martin Luther, Michelangelo, Isaac Newton, and even Mozart all had Pomeranians. It was said that Michelangelo’s Pomeranian sat on a satin pillow and watched him create his most famous masterpiece in the Sistine Chapel, so that was one cultured Pom. So since all of these very intelligent and talented people had Pomeranians, it is clear that this is the dog to have. 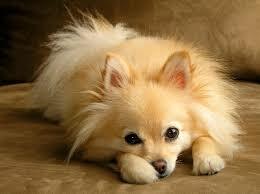 Pomeranians are very smart and loyal, so loyal that they can be very feisty and do anything to protect their family. They are also very independent and definitely have a mind of their own which makes them very curious about everything around them. While I mentioned before that they have a Napoleon Complex, that can get them into trouble because th ey will not be afraid to stand up to another dog or animal that is much bigger than they are which can cause some issues if not properly watched. Pomeranians tend to enjoy meeting new people as well as other animals but some Poms can be shy, depending on how they socialized when they are puppies. It is important to take any dog breed, but especially Poms, on walks outside to be exposed to different people, sights, sounds,and experiences. 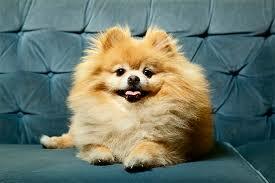 Since Pomeranians are so small, it is very easy to tire them out and give them their allotted exercise for the day. Simply throwing a ball in your backyard or a ten minute walk should be able to satisfy the needs of a feisty Pom. In conclusion, Pomeranians are vibrant, protective, adorable, and sociable dogs who can be a great companion, lap dog, or protector when you need one. Be like Isaac Newton and adopt a Pomeranian, he was smart enough to create the Laws of Motion and even smarter to adopt a Pom! Welcome to Blog of Dogs! Welcome, welcome, welcome to my blog! I am so excited for you all to read my blog about DOGS! You might be wondering why I would make a whole blog about dogs, well the first reason is because I love dogs and think that they are the best animals around. The other reason is that I miss my three pound teacup Pomeranian so darn much while I am living at college. So with this blog, I will be telling and showing you all a different breed of the week from a Pitbull to a Yorkshire Terrier. I hope that you enjoy my blog about dogs as much as I do!